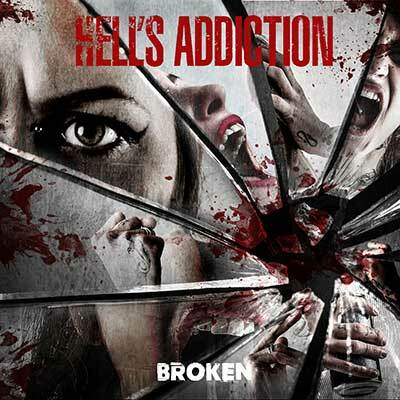 This week I have been given the opportunity to review an album by a hard rock band, the band goes by the name of 'Hell's Addiction'. I have been listening to the bands new album which is called 'Broken'. The band came together in 2010 in Leicester, born of a mutual passion for the hard-hitting rock of the great 70s and 80s bands. I will choose a song that stands out the most to me from the album but when an album like this comes along, which is filled with amazing songs throughout it makes it a huge challenge which fortunately for me I enjoy and with that said I have managed to pick out a song that song is track 4/Blue Lights, This song stood out the most because I am a huge fan of songs with slow starts and amazing vocals when it really starts it hits you and for me it just makes me want to headbang at at just the right pace aswell, definitely one of the best songs I have ever heard. This album is so goddamn amazing and I have thoroughly enjoyed every second of listening to it, Hell's Addiction you guys have created one hell of an album!! !